A slice through the centre of Australia, the Northern Territory contains the 'Red Centre' of the country with its rugged bush, ancient Aboriginal culture and amazing flora and fauna. This abundant wide open space is the 'Outback' of Australia. The Northern Territory is twice the size of California, but is inhabited by fewer than 250,000 people. It draws tourists by droves, however, because it forms the backdrop for adventure on a grand scale - hot-air ballooning, bushwalking, four-wheel drive safaris, camel rides - all enabled by good roads, quality accommodation and vast swathes of unspoiled wilderness. 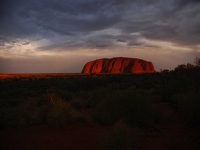 From Darwin, the capital of Northern Australia in the far north, down to the mysterious Uluru (Ayers Rock) and the pioneering town of Alice Springs in the south, the Northern Territory is a land of contrasts. Here you will meet some of Australia's most colourful characters and experience deserts, islands and beaches, wetlands teeming with birds and crocodiles, shining rivers and ancient Aboriginal sites. Travellers should be aware that especially during the summer months (usually between October and May) the shallow coastal waters of northern Australia become infested with marine stingers, commonly known as box jellyfish, whose sting is highly dangerous and can be deadly. Many beaches offer protected swimming with stinger nets in place, or enclosed tidal pools, and surf lifesavers may warn people off infested beaches. Swimmers may also wear a lycra 'stinger suit' as protection. We are looking for contributors for our Northern Territory travel guide. If you are a local, a regular traveller to Northern Territory or a travel professional with time to contribute and answer occasional forum questions, please contact us.